It's time to put the blocks together! If you missed the first parts of the tutorial, you can find all the posts by clicking on the thumbnail on my sidebar, or click here. 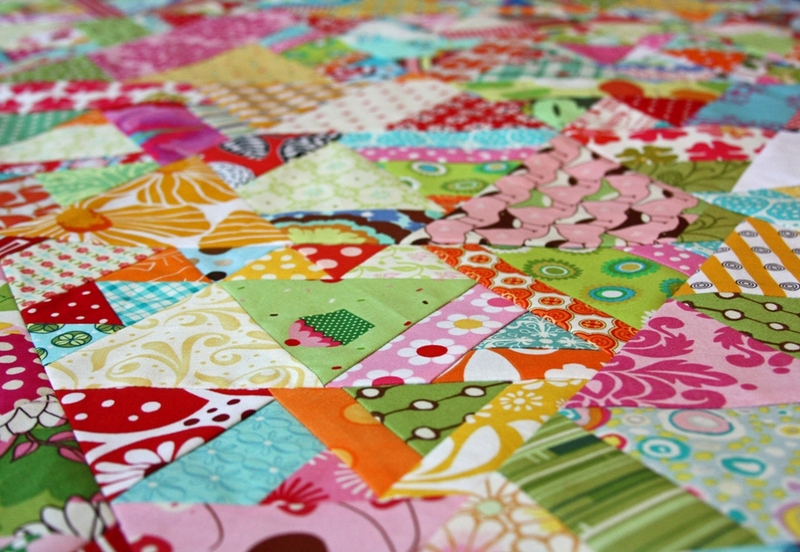 If you have any questions, any tips you can share for making this quilt, or any pictures to share, shoot me an e-mail. If you post tips or photos, I'd love to share the link on the tutorial page. As you can see, none of my triangles are the same size. I thought this would be a problem, but it actually turned out to be a bonus. You'll see why later. Sort your triangle blocks by size, beginning with the largest, and ending with the smallest. I sewed the blocks together in rows, beginning with my two largest blocks. You'll have decisions to make about how you arrange the blocks. 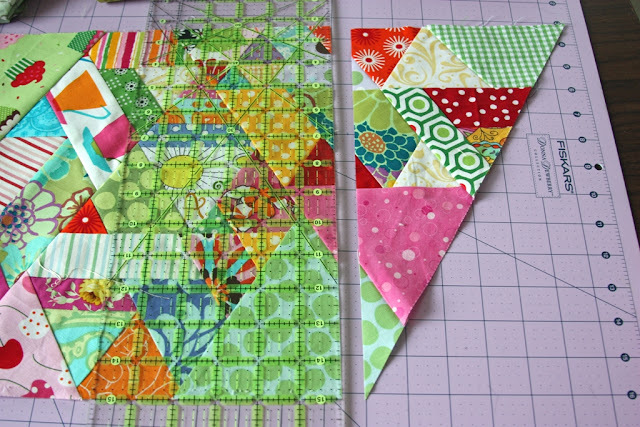 Since the block on the right is smaller, something will need to be chopped off from the block on the left. I like to keep intact as many of the true triangles as possible. I chose to sacrifice the point of the light fabric next to the green arrow, since this piece wasn't a triangle to begin with. The gold triangle on top (red arrow) will stay intact. 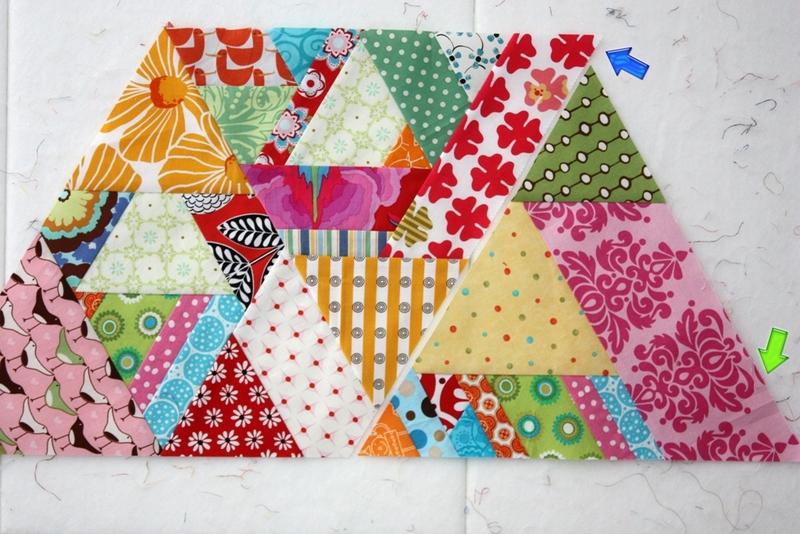 When I add another block, I'll trim the corner of the floral fabric next to the blue arrow. 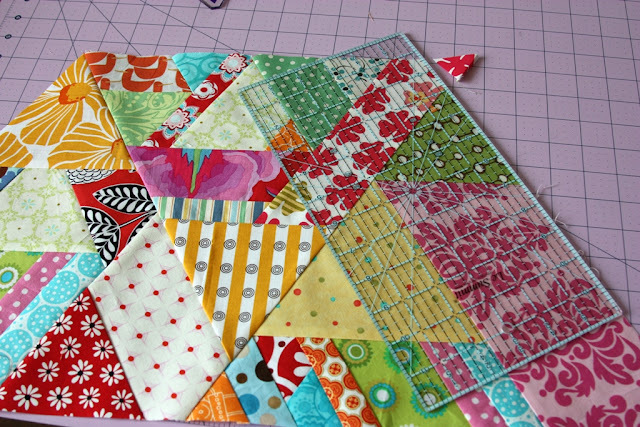 I recommend pinning the blocks together, since all the pieces have bias edges. 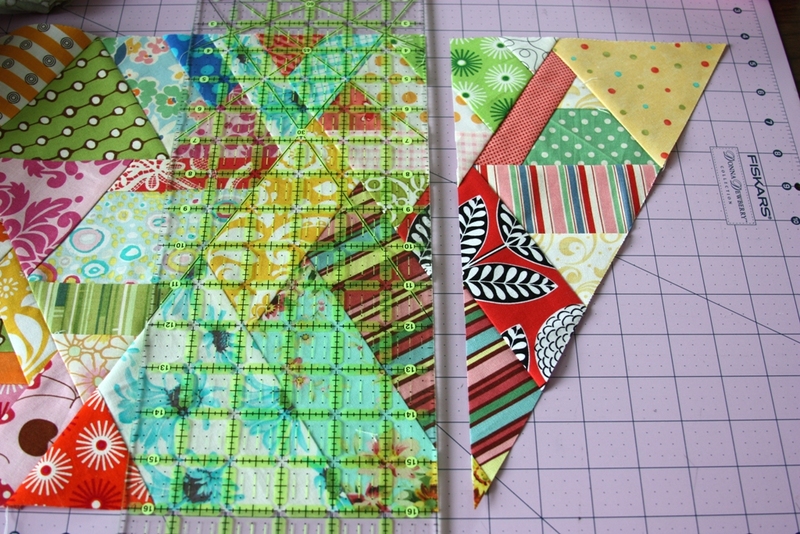 Starching my fabrics before cutting really helped to keep the blocks from stretching out of shape. 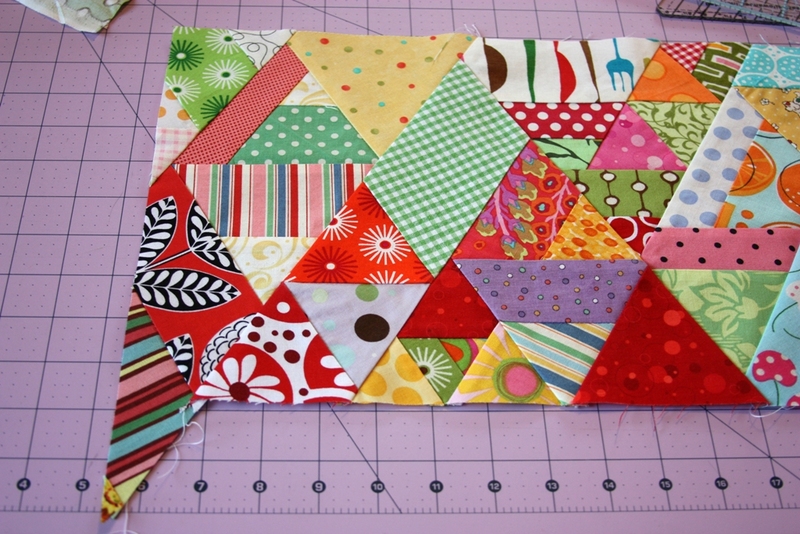 Sew the first two blocks together, and press the seam allowances in the direction they naturally want to go. After you press the blocks open, you'll end up with a weird little extended corner on the largest block. 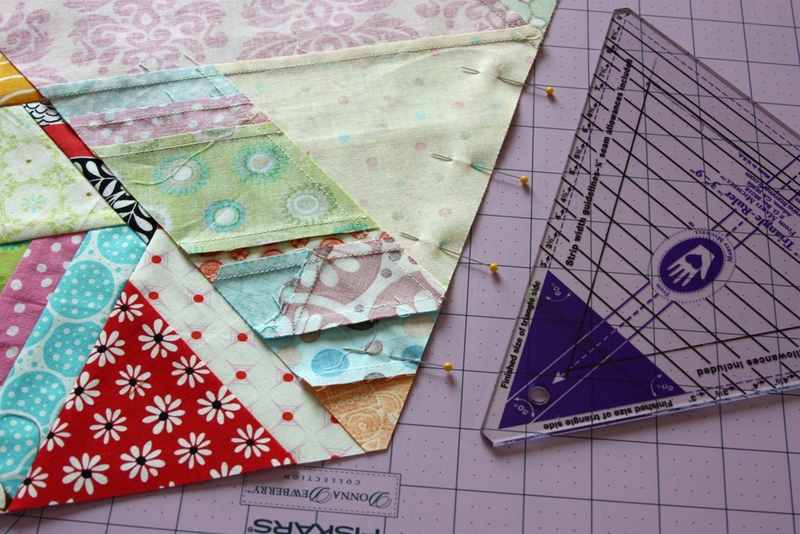 Place the 60-degree line of the ruler (highlighted in yellow) along the seam you just sewed, line up the edge of the ruler with the edge of the block, and trim away the weird extension. I found it helpful to trim the points of the blocks that align with the other straight edges. I hope this makes sense. Here's a photo of a trimmed block -- see the bottom point? I used a 60-degree ruler to do this. It isn't necessary, but it helps. I don't have to guess about how far the point needs to extend to get a good quarter-inch seam allowance. Add your next largest block. My new block is on the right, but you can add it to either side. I had already decided to sacrifice the point of the pink floral (blue arrow). 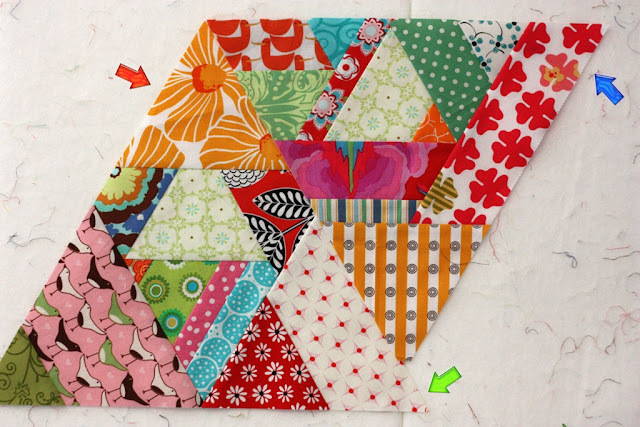 I wanted to keep the large green triangle intact, as well as the tiny orange triangle, so I arranged the new block so that the pink fabric (green arrow) will be trimmed after sewing another block to it later. Sew the blocks together and press the seam allowances in either direction. Trim off the extended point. Decide how wide you want your quilt to be. Continue adding blocks to the row, using the next largest block every time you add one, until the measurement between the imaginary lines (below) is close to your desired width. You'll trim off the parts that extend beyond the lines to square up the row. To square off the ends of the row, place a horizontal line of your ruler along the bottom edge of the row. Trim off the excess part of the row and save this piece for later. Rotate the row so the other end is on the right. Square up this end of the row. You'll end up with this. My first row is about 55" long, and 12 1/2" wide. The height of the row will depend on the height of your first triangle block. Look closely at the blocks. Since the blocks are different sizes, it's difficult to tell where one block ends and another begins. I think it makes the quilt look more complex than it really is. Begin your second row the same as the first, with your largest block. This row won't be the same height as the first row, because your blocks will get progressively smaller. 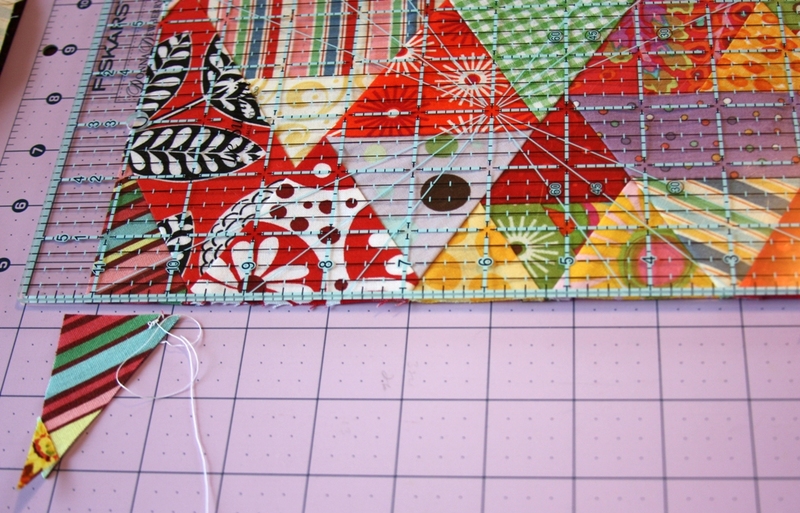 You can alternate wide and narrow rows when you put your quilt together. Continue adding blocks to your second row until the row is almost as long as the desired width of your quilt. Using one of the leftover half-triangle pieces you trimmed from the first row, sew the leftover piece to the beginning of the second row, and press the seam allowances. 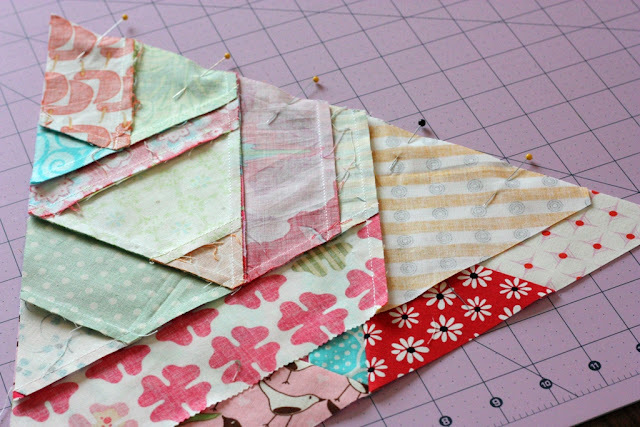 Since the first row is larger, when you sew the leftover half triangle to the second row, you'll have plenty of fabric to cover the end of the row. You'll need to trim the extended point. Line up the edge of the ruler with the bottom of the row, and trim. 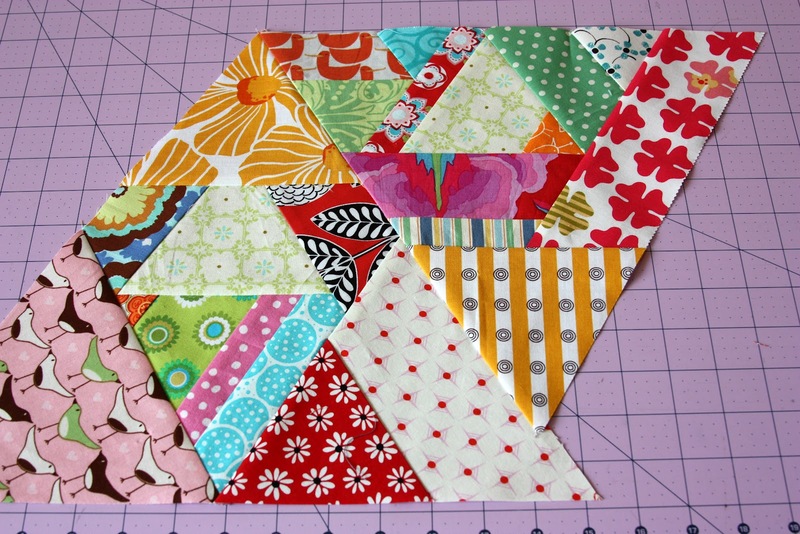 I used most of my filler strips to construct the blocks, but you can use them to extend the length of the rows to avoid adding an entire extra triangle. You may or may not need to add the half-triangle leftover piece to the right edge of the row, but it may be just enough to fill out the row to make it the length you need. You'll want to trim the second row, and all subsequent rows, so that they're the same length as the first row. 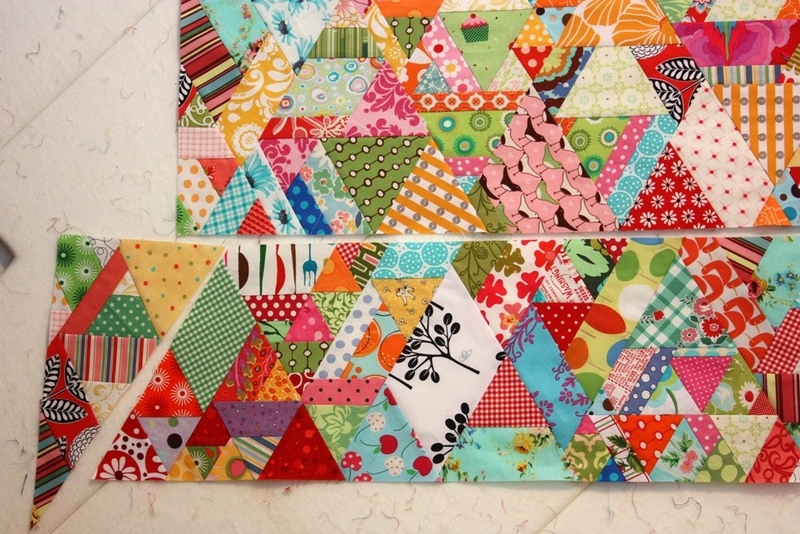 This will be the width of your quilt. Just keep adding rows until the quilt is as long as you want it to be. 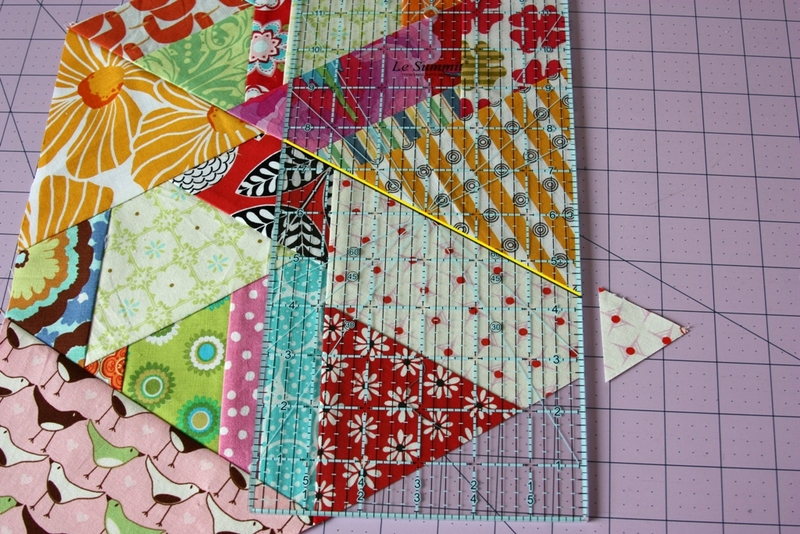 I thought I had enough triangles, but I made the quilt a little wider than I intended, so I'll need to make another couple of rows to finish. I'll show you the whole quilt later. It's going to be much bigger than I thought! Fortunately, I always have plenty of help. Your quilt is beautiful. Very interesting concept. I don't think I have ever seen a quilt done like that. Love the fabrics you used. You must certainly love color. Hope you had your sunglasses handy while working on this. Love the shots of the cat helping. 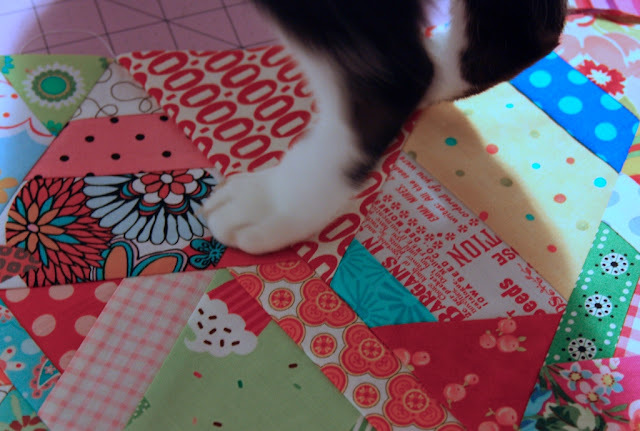 My cat use to love to help when I would quilt or rotary cut too. What a beautiful quilt! 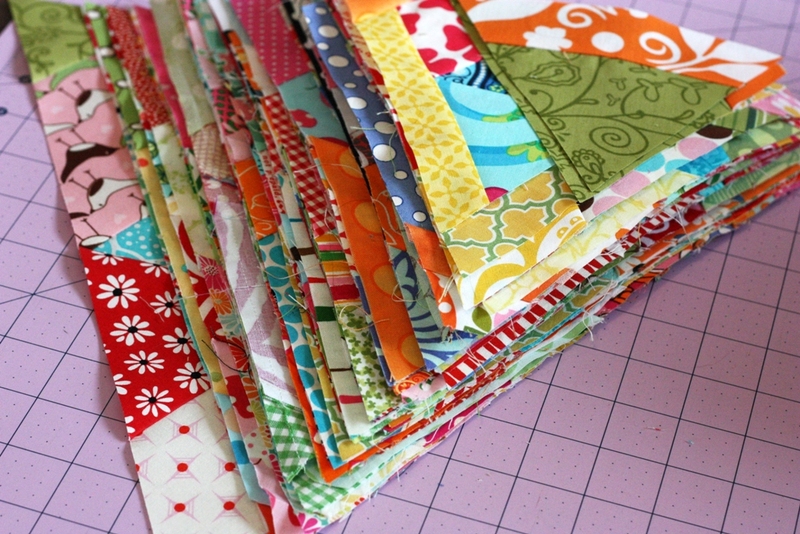 I love the scrappiness and all those fabulous colors. 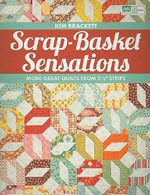 Fabulous scrappy quilt, Kim. Your tutorial is wonderful. Thank you. What a great quilt! It is so beautiful! 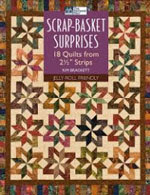 This will be one of my prioritized projects when I return home from my vacation. Thanks for a great tutorial. 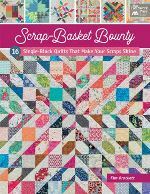 What a beautiful scrap quilt. Inspirational. Thanks for the great tutorial too! I definitely want to make this. You've been missed. That is my most favorite scrap quilt ever. I just love the colors and prints. 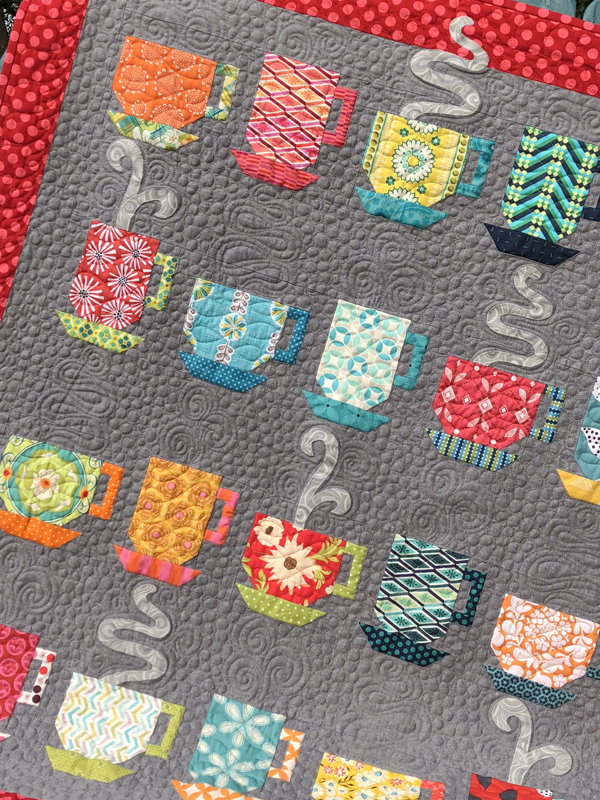 You can't make a mistake with this quilt! Such a great tutorial. Thank you for sharing. I love how colorful it is. My mother would say, "A riot of color." I love the way your brain works :). This is pure happiness. It's a long way from those homespuns :). This quilt is awesome! I love the bright happy colors. You make it look so easy, but there's a lot of piecing in there! Great tutorial. I read the earlier ones and was very tempted to give it a go. 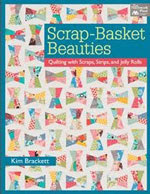 Very clever way to use scraps. Yours is looking fabulous. Your quilt is stunning! You have a interesting way of making the quilt! Wow! This looks like fun! What a cool quilt! Great tutorial too. I wish I had a scrap pile like yours......gorgeous fabrics! Resplendent! I love the way you pieced some of the 60 degree triangles. Cute idea. I made a 60 degree triangle quilt in red, white, and blue for my son's curtain. Have a super day! Oh my word I must make one of these! Thank you for the tutorial! 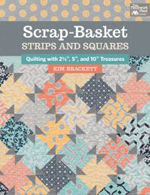 fabulous idea...sorta a wacky way of sorta doing a triangle log cabin method but not...great tutorial. I am going to have to try making one. 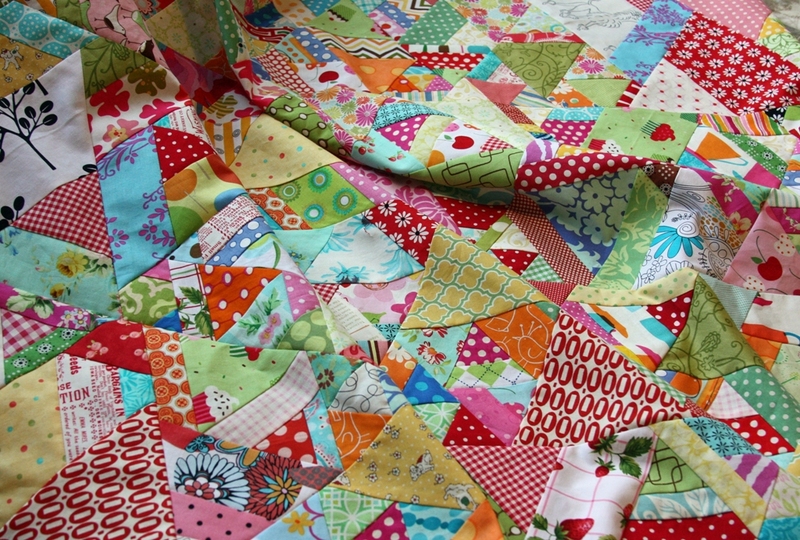 the thing I like the most at qulting is that you can always extend your quilts by just adding some more forms. The 60 degree pattern is so good for that. Thanks! Great idea....great tutorial. I am going to try it myself. Can't wait to see your quilt finished. Wow thank you so much for this amazing post related to quilt. This is stunning! (discovered via Aurifi's Facebook post today!). Great tutorial, thank you!